Apple Stores will reportedly stop selling Fitbit products, which are not compatible with the HealthKit tools in iOS 8, as a new model with heart rate sensing capabilities is expected to hit the market soon. Citing unnamed sources, Re/code reported on Wednesday that Apple apparently plans to stop selling Fitbit devices at its stores "soon." No reason was given for the change, but Apple plans to get into the fitness tracking market itself early next year with the launch of the Apple Watch. The report comes after Fitbit said on its official community forums last week that the company currently does not have any plans to integrate with HealthKit, Apple's developer tools for health and fitness related data. Fitbit said it has been "evaluating integration with HealthKit" since it was announced, but noted that Apple's solution only works on the iOS platform. But the company also suggested it could change course if there is enough demand among users. "Your voices are being heard," the company said. "We're actively reviewing your responses and providing feedback to our product development team." Apple's retail stores also carry fitness tracking devices from other companies, including the Jawbone Up, Nike Fuelband, Wahoo Tickr Heart Rate Monitor, Withings Pulse O2 Activity Tracker, and many more. Wednesday's report said it is "unclear" whether Apple will continue selling those other devices that could compete with its own watch. Apple stores currently carry both the wrist-worn Fitbit Flex, and the smaller Fitbit One activity trackers, which sell for $99.95 each. But the company has a pair of new models expected to hit the market soon, the details of which were leaked this week by Gizmodo. 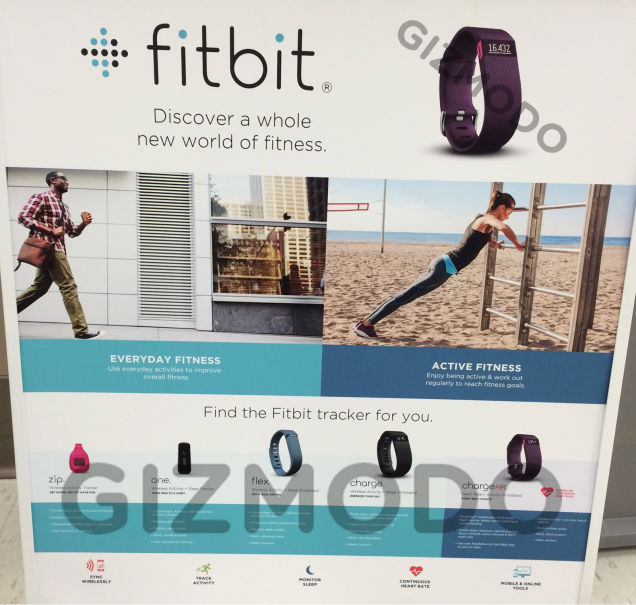 Marketing materials for the anticipated new hardware reveal the Fitbit Charge and Charge HR. The Charge appears to be a reworked version of the Fitbit Force, which was recalled earlier this year because of apparent skin irritation issues. The Fitbit Charge HR includes heart rate monitoring, which would be a new feature for Fitbit devices and a function bringing it into more direct competition with the Apple Watch. The materials suggest the wrist-worn device will track a user's heart rate all day, and provide feedback for better calorie tracking and cardiovascular training. Both the Charge and Charge HR are also shown to track steps, distance, calories burned, floors climbed and active minutes. They'll also offer basic wrist notifications, displaying statistics, time and caller ID from a connected device like an iPhone. The Charge models are also shown to monitor sleep quality and include a silent vibrating alarm. They're also water and sweat resistant.